Rick Scott finally released his plans for the budget - somewhat. To fill Florida's budget gaps, Scott has proposed a cut in taxes for corporations and property owners, cuts in education and transportation, and a doubling of funds for his office. While I agree with a budget shrink, Scott is going about it all the wrong way, but when he delivered his budget to an audience of mostly tea partiers, all he heard was applause after applause - they hosted the event. The plan was presented in a 167-page, broad-brush document that leaves most of the details for lawmakers to flesh out during the legislative session that starts March 8. But it calls for reducing overall spending by $4.6 billion compared to the current fiscal year and reducing the state workforce by 8,681 employees, or nearly 7 percent. Scott said about 2,000 of those positions were unfilled. Pre-K through university budgets — which Scott had pledged to protect during his campaign — would face $3.3 billion in cuts, dropping from $22.4 billion this year to $19.1 billion. For public schools, per-pupil spending would fall by about $700, a cut that would be partially offset by Scott's push to require all teachers to begin contributing 5 percent of their earnings to their pensions. Those dollars are currently paid for by the local districts and state. At a news conference in Tallahassee, Scott said the proposal didn't break his campaign pledge because school-funding from Florida's general-revenue bank account was remaining the same. But his budget doesn't replace federal stimulus dollars that disappear this year, thus causing a real-world decline in spending. "If you win the lottery this year, you think you're going to win it next year?" Scott said. "We're not going to take federal money and believe it's going to be there forever." Scott also would all-but-eliminate the state's Department of Community Affairs, the growth-management agency he's called a "job-killer," slashing its budget from $778 million to $110 million. Total employees would drop from 358 to 40. "The fact is the government has got to get back to its core functions, but only its core functions," Scott said. But environmentalists panned the idea. "It does suggest a lack of understanding of the economic value of growth management," said Richard Grosso, an environmental attorney at the Everglades Law Center. "The idea that managing growth costs money is completely backwards. One bad planning decision can cost any city or any neighborhood a lot of money." Other agencies with big cuts include Transportation ($441.5 million), the Agency for Persons with Disabilities ($173.9 million); and the Department of Children & Family Services ($178.5 million). The DCF savings would come partially from privatizing the state's three remaining publicly operated mental-health facilities in Chattahoochee, Macclenny and Gainesville. Florida has already privatized five other mental health facilities. But despite Scott's promise to save $4 billion over two years by creating a "patient-directed" Medicaid system — mostly likely some manner of health maintenance organization — his recommended appropriation for the agency that oversees Medicaid would rise by $1.2 billion next year, to $22 billion. Medicaid itself would grow by $2 billion in the governor's budget to account for enrollment growth, although the plan would cut the rates the program pays to hospitals, doctors, nursing homes and managed-care companies by 5 percent. Next year, the governor hopes the federal government and state lawmakers will agree to largely privatize the program. Another agency Scott isn't cutting is his own office; its budget would nearly double to $638 million as Scott attempts to streamline economic development efforts and bring them his control. Scott's cuts means bad news for Floridians. While I think the teacher contribution into their pensions is a good idea, I think 5 percent is too high to begin with - it sounds small but teachers are already strapped for cash, and the only reason why they are being targeted is because teachers unions have become a political enemy of the far-right. Pensions can pose a problem for local and state governments, and people like Scott have used that to foment anger in his supporters who do not receive such pensions. Scott's gutting of the Department of Communnity Affairs also spells trouble - with funds for the agency almost completely elliminated, Florida will soon experience an era of unresponsible growth - similar to what led to our housing bubble. The solution to get out of the current economic situation Florida is in is not to build more - doing so will only negatively impact employment and property values. Take into consideration Scott's proposal to slash property taxes, corporate taxes, and social services, and the future looks pretty dire - Florida will experience high unemployment and low tax revenue, placing Florida in a much more difficult hole to climb out of. Scott's proposed cuts to the Department of Trasportation and the Agency for Persons with Disabilities also spells disasters - Florida's infrastructure is already unadequate, due to explosive growth in the last two decades and unresponsive development plans, and 23 percent of Florida's population is over the age of 60. Cutting funds for essential services will only be more of a drain on the already tight private sector. It is nice that not all budgets are having their belts tightened - Scott's office is nearly doubling its budget to $638 million. Why would a small government candidate increase the budget to his office? I suspect it is to hire a bunch of his business cronies and stack the government with his allies - he already fired the head of Florida Enterprise, the state's public-private economic development arm, in order to re-create the Department of Commerce, placing economic development directly under his control, seating the secretary of the new agency on the first floor of the Office of the Governor in the Capitol. In late 2009, locals elected Edward P. Mangano as their county executive -- one of the first big upset victories for the so-called "movement" -- after running on a predictable platform. Mangano would slash taxes, cut spending, and create a nice little utopia. Voters loved the sound of it. A year later, "Eddie" had slashed taxes as promised, but struggled to limit public services that the community had grown to appreciate. This week, the consequences of Tea Party economics became clear -- Nassau County, facing a full-fledged fiscal crisis, saw its finances taken over by the state. The [tax cut policy] set Mangano on an immediate collision course with the state-appointed fiscal overseer, the Nassau County Interim Financial Authority, or NIFA. It culminated in NIFA seizing control of the wealthy New York county's finances on Wednesday. Nassau's ills exemplify the growing tension across the country as dozens of freshly-elected Tea Party lawmakers, many of whom promised to cut taxes, must find ways to slash record budget gaps as revenues dwindle. "A lot of people who got elected on this type of anti-tax platform are running into the brick wall of fiscal reality," said Matthew Gardner, executive director of the non-partisan Institute on Taxation and Economic Policy in Washington. Besides being a cautionary tale, the setback in Nassau County is a black eye for the Tea Party, the grassroots movement built around the core principles of constitutionally limited government, free-market ideology and low taxes. Mangano stressed a "tax revolt" platform as a candidate, but few bothered to notice that his numbers just didn't -- indeed, couldn't -- add up. He ran against an incumbent who felt like he had no choice but to tell voters the truth -- he'd have to raise taxes to prevent a disaster -- and the public didn't care for it. Mangano didn't quite understand the county's fiscal problems, but proceeded with his agenda anyway. And now we see the consequences. Tea Party economics always sound nice, right up until these ridiculous ideas are actually implemented. Well? 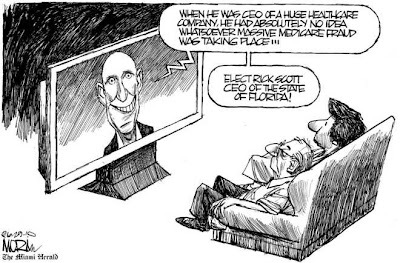 Looks like Florida voters were stupid enough to vote Scott into office, but lets hope they wont be fooled again.